A few weeks ago I started a search for stylish yet practical waterproof clothing that would pack small for the trip. This has been a lot more difficult than one would imagine. Most of my google searches returned items that looked very much like ‘sport cycling’ clothing with all the standard ‘essential’ features of fluorescent colours, shapelessness, and pockets on your bum. I am so bored of fluoro and resent the lack of imagination applied to these garments – how about some choice people? The default of lurid citrous colours is sooo predictable and doesn’t suit anyone. It will certainly be very inappropriate in most European countries with mature cycle cultures and will expose me as a cycle tourist from somewhere less fortunate. And why shapeless? Is it so hard to add darts and tailoring to waterproof fabric? Don’t get me started on the pockets on the bum compulsion. What’s that about? Personally, being a lady who is already well endowed in the rear-end department, the very last thing I wish to do is add to its volume! I have my suspicions that it is a trend that has come down from top athletes who do actually need pockets on their bum. They are so crouched over that their backside is the only spare real estate, and they are obviously highly speed focused so the positioning of the pockets and the lack of basket or panniers is most aero dynamic. None of these things are relevant to cyclopolitans. However, eventually I happened upon a couple of likely candidates (so it is possible!) and promptly ordered a few items. They arrived this week with mixed results. The Water off a Ducks Back gentlemans coat that we ordered for the Husband was very nice and quite stylish but unfortunately too small, so with regret that will need to go back. The ladies jacket I ordered, was promising initially but was poorly made and had no lining, which was a surprise. This will also be returned. The red cape I ordered did not arrive so I have sent an email to query this and I will let you know what I think when it turns up. The Georgia in Dublin items were an absolute joy to behold. The presentation was far superior to the above items, they were beautifully packages and labeled. The quality of the workmanship is excellent and the items themselves are really well designed. I absolutely love the rain skirt and the leggits – they are very attractive, well made and really functional too. I just can’t wait for some rain to test them out, but to be honest (and this is the true test of rain gear) I could just wear them out in the street when it isn’t raining and would feel great in them! So the hunt is still on for a waterproof jackets for the Husband and I. The selective wine drinking didn’t go so well this week – so that’s a fail – I went to an industry ‘do’, didn’t look at any labels and got decidedly squiffy … it’s a ‘try harder next week’ for that one. Our Trademe downsizing project is going quite well and we have fallen into quite a nice rhythm of listing 5 new items every week – I do the photographs, the husband’s on words. I’m getting really quite addicted to people giving me cash and the wonderful cathartic experience of de-cluttering. 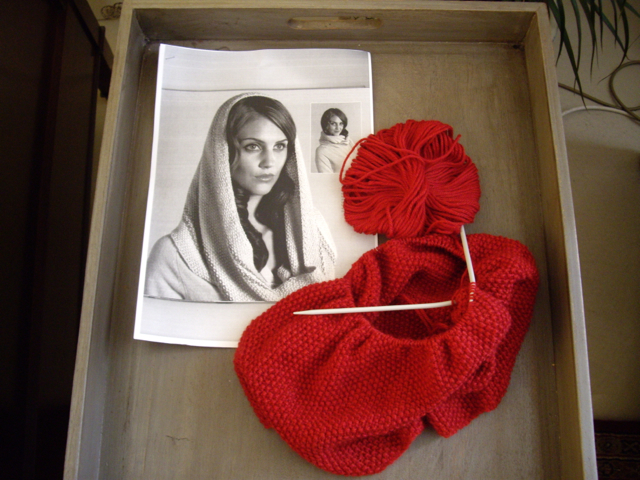 I’ve bought some wool and have started knitting a cowl for the trip (for the uninitiated, imagine a scarf where the ends are connected together to form a circular scarf). I sometimes have problems with scarves trying to blow off in the wind and this seemed to be a good solution to the problem as it can’t really go anywhere but around and round. I have also ordered wool to knit a cardigan for the trip. This may seem premature but I am a very slow knitter and may need the full year to complete the project. Daughter No.1 has just suggested that a even the year may well be an ambitious timeframe based on previous experience … but I am determined to pick up my game! Richard Barter from Puketapapa Local Board manged to get his hands on a ‘cycling’ jacket – vents etc, but looks completely like a normal jacket, albeit in light tan corduroy… could ask him for pointers on suppliers? @ Christopher – yes, I have seen him in that jacket – very styley. I think it may be a Brompton jacket as they have one quite like that but it would be great if you could ask him next time you see him. Thanks. Love the rain skirt and am trying to make one for myself. Could you post a photo of the rain skirt open please? I’m not an expert sewer but am trying to use good old kiwi ingenuity! Cheers.